There's only one thing to do when the days and nights are dark and chilly. Eat good food and drink fine wine! It's time to indulge in some serious bistro action, and whether it's a long, relaxed lunch or a cosy, candlelit dinner, Charlotte's Bistro in Chiswick hits the spot. This is a proper neighbourhood local, and I was lucky enough to try it out last weekend for lunch with some friends. 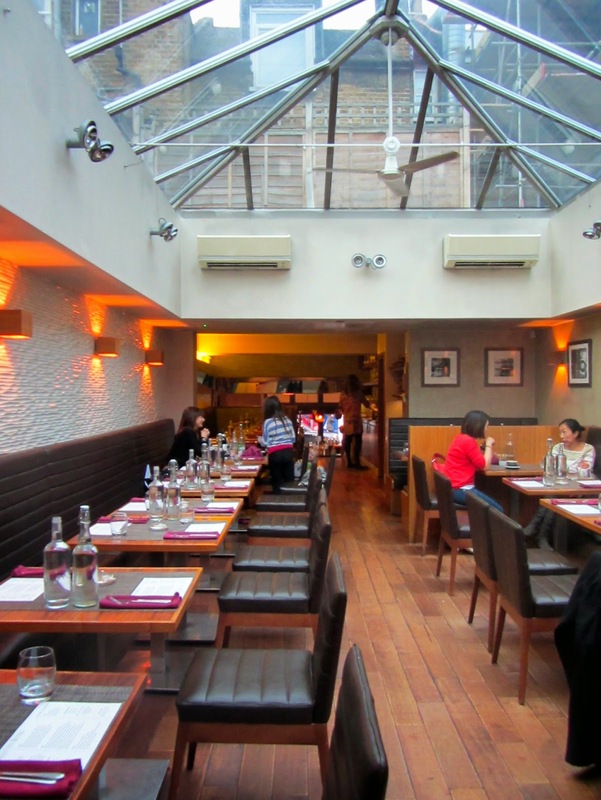 The vibe at Charlotte's is very chic and modern European with a menu to match. There's a separate cocktail bar at the front with a few dining booths, then steps up to a large, bright dining room with a glass atrium which must be lovely when the sun shines. The a la carte menu at Charlotte's Bistro is well thought out, and Head Chef, Lee Cadden has clearly put a lot of time and effort into creating an interesting and varied autumn/winter menu, using hearty, seasonal ingredients. We opted for the Market Menu which offers a very reasonable 2 courses for £16.50 or 3 courses for £19.50 and includes a glass of wine, beer or something soft. We shared some Parmesan & Sage Beignets to nibble on which were so moorish, we could have demolished a few bowlfuls. 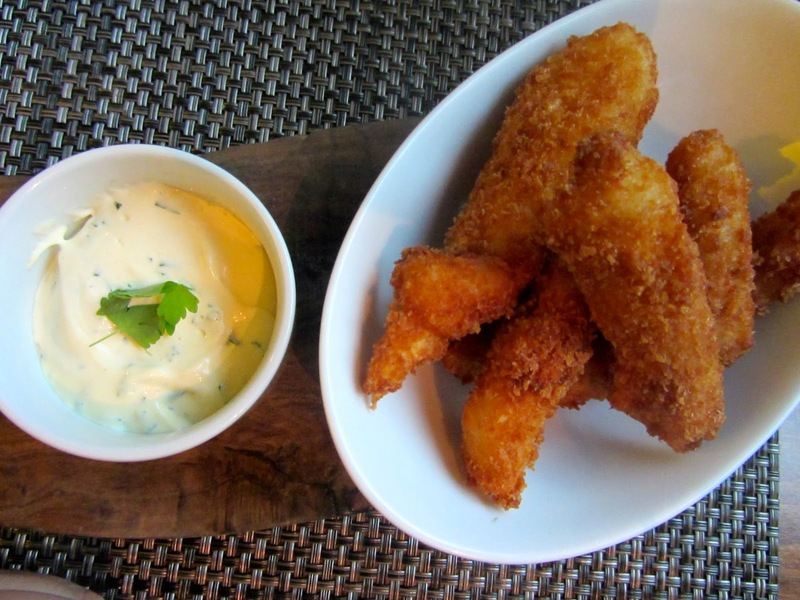 I had the cod goujons to start which were a generous portion and tasty enough on their own, but a slice of lemon on the side wouldn't have gone amiss as the accompanying sauce was very bland and lacking in 'tang'. For the main courses, we tried the Corn Fed Chicken Breast with Jerusalem Artichoke & Braised Bacon, and the Gilt Head Sea Bream with Crab & Cauliflower Cassoulet and Curry Oil. Both dishes were excellent and perfectly cooked. But being a Market Menu, there were no side dishes included which meant the meal was slightly meagre. In hindsight, I would definitely have ordered a couple of additional side dishes to share. We were given a complimentary blackberry sorbet after our main course, which was really delicious and went down a treat, especially with my little boy! Finally, we indulged in a couple of puddings. The Brioche Doughnut with Apple Compote, Salted Caramel & Calvados Cream was apparently amazing and demolished before I could take a photo. I had the Dark Chocolate Delice with Toasted Hazelnut Cream which was exquisite. All the dishes were very well presented and the service was friendly and fast. I also like the fact that children are welcome and high chairs are provided (although there are no baby-changing facilities). And if you're into oysters, then why not perch at the bar and treat yourself to some, supplied by the Wright Brothers, purveyors of first class oysters. With a cocktail or two. As well as a huge array of cocktails, Charlotte's also pride themselves on good wine, and recently invited top notch Wine Sommelier, Matthew Mawtus back to help create their impressive new wine list. 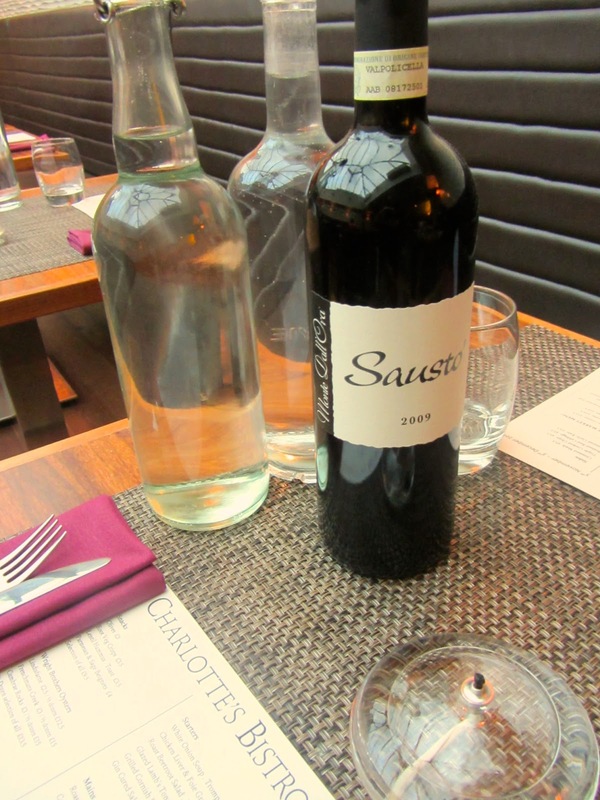 We were offered the 2009 Valpolicella Superiore Ripasso 'Sausto' which was so good, and perfect for a chilly November lunchtime, that we opted for another carafe. On a warmer day, I would definitely have been tempted to try the Viognier 'Les Contours Deponcins', or Albarino 'La Mar'. As for gin, I do enjoy a tipple, but I would struggle to name more than 5 gin brands. However, at Charlotte's there are at least 30 different gins available! So if you're a fan of gin 'n juniper, then you must attend their Gin School on a Monday evening (until 1st December). So, with all that excellent food, oysters, wine, gin and cocktail action going on, it's easy to get a bit hooked on bistro life. And why not!